It’s almost impossible to define Australian cuisine. The food we eat has origins in every corner of the world. What was a typical Aussie meal when I was a kid has been tempered by the food brought by successive waves of post war migrants. Australians have embraced Italian food as if we were weaned on spaghetti, my family has even replaced traditional festive treats such as Christmas fruit cake and fruit mince pies with pannetone and panaforte. I confess to buying the family panettone from Brunetti, a Melbourne institution, but every year I make panaforte as no commercial product can measure up. Grease a 30cm X 30cm shallow cake tin. Chop the apricots, figs, dates, pineapple and mango into small pieces about the size of the nuts. Sift the flour cocoa and spices into a large bowl, add the fruit and nuts and orange zest, stir to combine, separating any fruit that has stuck into clumps. Heat the sugar and honey, stirring constantly until the sugar is dissolved. Bring to the boil and cook the syrup until it has reached soft ball on a candy thermometer, 116C or 240F. If you don’t have a thermometer, remove the pan from the heat when you think it done, drop a small amount of the syrup into cold water and it will set immediately into a soft ball if done. If the syrup dissipates in the water, return the pan to the heat and cook a little longer. Pour the honey sugar syrup over the fruit nut and flour mixture and stir thoroughly to combine. Tip the mixture into the prepared cake tin, then with wet hands press it evenly and firmly into the tin, smoothing the top as you go. Bake for 45 minutes at 160C. Cool on a wire rack. Panaforte will keep for months (if you can resist) wrapped tightly in foil then in an airtight container. Cut into 2cm squares to serve. Australians have certainly embraced Italian food. I was thinking the other day that we’ve all got a clove or two of garlic in our pantries as a matter of course these days, yet I remember when we didn’t know what garlic was let alone how to use it. Now I can’t imagine a dish that doesn’t absolutely need garlic for flavour. Panatone excepted of course. What a fantastic looking recipe. Thanks. It’s dense, chewy and delicious. I have only ever tried the shop bought version – but this looks amazing I will give it a try sometime! I never heard of it, but it sounds really good! it’s also known as Sienna Cake, ‘cos that’s where it originated from. In that case, I’ll have to send the recipe to my my sister whose granddaughter is named “Sienna”. She’ll get a kick out of it! 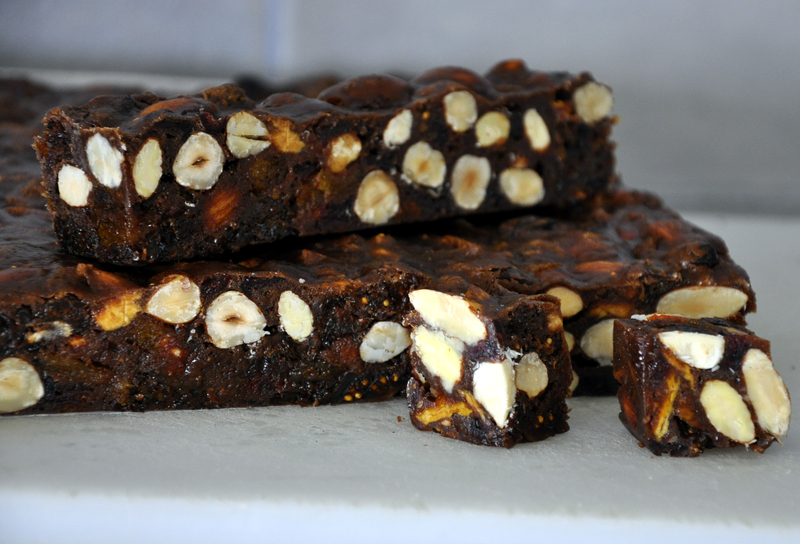 This entry was posted on December 23, 2012 by ladyredspecs in Baking, Desserts, Food, Slices and Tray Bakes, Sweet mouthfuls and tagged Christmas, fruit, Italian, nuts, panaforte, vegan, vegetarian.